I LOOOOOOOVE your site. Thanks for all your hard work! I have been bookmarking MANY pages on your site for all the redecorating I plan to do. … I just bought a 1961 tri-level. It has a brick wall with a fireplace and a “seat” that runs the length of it, if that makes sense. It was the reason I decided to look at the house! I would LOVE your help with what to do with it. Did they put pillows on it? Also, was cork floor ever used in a kitchen in the 50’s or 60’s? I am thinking no. I respond: THAAAAAANK you, Rebecca. That is so sweet. Question #1 re the fireplace; Hmmm. I am going to have to scour my materials this week, and look for examples of circa-1961 asymmetric fireplaces like yours to see how they were decorated. My initial response is: No, that ledge is not intended to be a seat. It doesn’t make sense – as the mantel is kind of too close for comfort… like, you’d bump your head and also, it seems kinda narrow for seating although no doubt they had smaller tushes that we do today. One thing am I pretty sure of is that the first thing I’d look for is a mid-century style fireplace poker set to go to the right of the fireplace. Even if you don’t need it, well, it would look cool. Then: Tchotchkes or art on the mantle, and hmmmm, what else on the seat? That is a good question we now have on our plate. Readers…what do you think? How were these things decorated? Question #2, regarding cork in kitchens. Yes, I think this was done, albeit less frequently, so go for it. The key with cork — is that it can be porous. But, today, I think that there are many cork styles that are very well sealed through the magic of modern chemistry. So, when you go shopping for your cork flooring, be sure to check to see how it’s specified. Does the manufacturer say it can be used with kitchens… that it’s watertight enough? If so, you’re in business. Note – Maribeth installed a cork floor in her renovated kitchen, I am pretty sure. I ask Rebecca to tell us more about her Retro Renovation story. 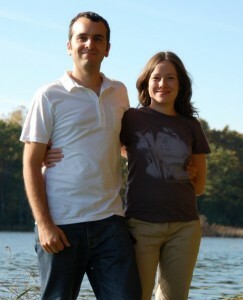 We moved from the East Coast (I moved back) to live and buy a home in the Midwest. First I decided against the areas of town that the homes were from the 30’s because the yards are small and all are too close together. I really didn’t want a 70’s colonial, which also seem to be everywhere here. I decided that I wanted a split-level or tri-level, because I generally love things that look “dated” andor are from the 60’s. Once I figured out that that was what I wanted, I was determined. I wanted a real neighborhood of streets, not a subdivision. My realtor sent me the link to this house along with many others. THE aspect that made me want to see it was the brick wall with fireplace. We liked the neighborhood because it has a lot of homes from the 60’s, and it’s very nice but modest. The house we saw right before was a 1969 colonial, which my fiancee liked, and I remember feeling like an argument would occur when I had to tell him that I just couldn’t do it. I didn’t have to deal with that because we loved this house immediately. Right when we got to the door we loved the windows on the sides of the front door with diamond shapes and wavy glass. And when I saw that there is an attached, screened-in, three-season porch I actually said ” this is enough to buy it!” The four rooms on the upper level are hardwood, and the lower level is better-than-usual-looking pergot. The only major work that NEEDED to be done before moving in was the awful green carpeting on the main level. (atrocious!) Other plusses include big bay windows looking out to a nice and private back yard, a pink-tiled guest bathroom, and shiny new Dishmaster! My style is basically all things retro, but not too kitschey, and I love Scandinavian/Danish Modern…. We still need to PAINT! I hate white desperately. Keith is going to make something to have printed on canvas, with my helpful opinions, for above the teak record stand. So much of this room is craigslist, btw. I want this area, which is the lower level/media room, to feel good for cocktails near the fire. 🙂 I have a Room & Board couch down there, and an orange Ikea rug, and Ikea coffee table. I love that wall! Honestly, we were practically sold when we saw just that. BTW, the fireplace has a “Feastmaster” on the right side, of course written in fabulous typeface. Do you know what that is? It’s a grill on which to make steaks! So 60’s – love it. We were thinking of this Ikea lamp for it because we love it. What do you think? But, we didn’t actually buy it, yet. Oh, And I would love to do something to the walls. My dream is wood paneling-the nice beautiful hardwood kind. My god if I could have it be teak, I think I’d die. The kitchen isn’t retro, except for my tupperware, Martha Stewart clock, and Typhoon scale. Typhoon makes these adorable items! I LOOOVE my bread box so much. 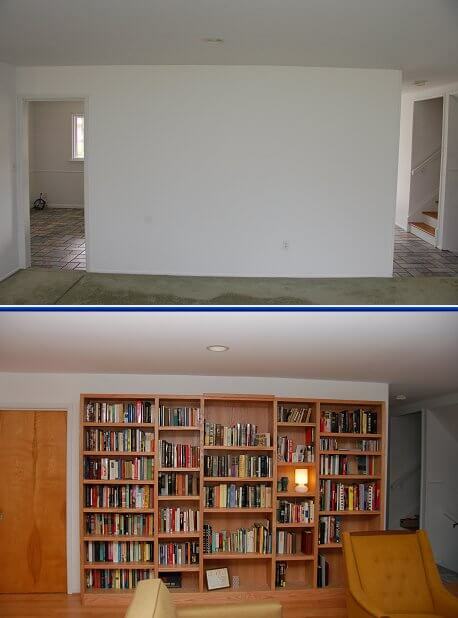 Keith’s lifelong dream…a built-in bookshelf. I love the plate around the bathroom shower faucet!!! The tile in shower is different than the floor. The milk glass vase is from a thrift store (I collect them ) but the soap dispenser, toothbrush holder and box are all Martha Stewart from last year. I love the formica on the countertop. BTW, you know how you took that old ad for the pink and green kitchen (with the fabulous lady talking on the fabulous pink phone) and you broke it down telling people how to get that look? Complete with the laminate color, cupboard pulls, and floor? That was great! I love it! Phew. Those were a lot of photos, Rebecca, so I am pooped. I’ll be comin’ at you again tomorrow with some ideas and suggestions. This has been a fun one. A Feastmaster! And after cookin’ those steaks, clean up with the Dishmaster! Awesome. .
Back tomorrow with ideas for you! Many thanks for sharing all these great images, and your story. As someone with a similar aesthetic embarking on the process of a kitchen remodel in our mid-century home, I enjoyed this story and loved the photos. So, you can’t imagine how excited I was to see that we live in the same town! If you’d be game, I would LOVE to talk to you about your experience from contractor to cabinet maker. To find the same project in the same style in the same MARKET? You’d be a wealth of insight!!! I remember my grandma’s fireplace ledge would have potted plants on it (well away from the fire obvs! ), along with the fireplace kit and a heavy (resin?) statue of a mallard duck! (she had a matching ‘duck’ bathroom in her house, and a duck chlorinator in the pool!) So I’d say go for little statues made of sturdy stuff, maybe mount one of those atomic star clocks on the brick next to the fireplace? There’s always a lot of metal wall art in that kind of area in a midmod. But if you ask me, it looks like what us CPs* would call a catshelf.